Voting is underway for the 2018 NBA All-Star Game, and the guys in Cleveland are acting up. 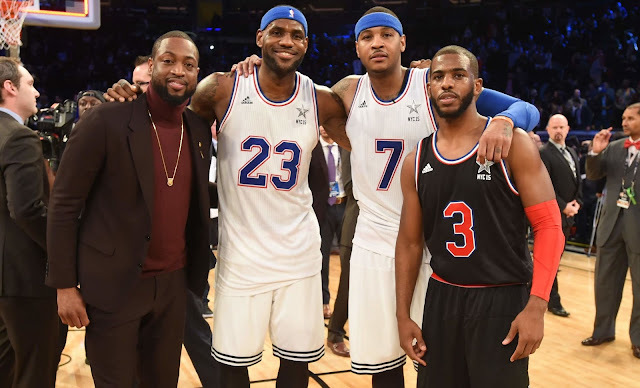 I realize the All-Star game is primarily entertainment, but it doesn't have to be a circus. Dwyane Wade of the Cavaliers is making a push via Twitter to get his buddies into the game, and he is not very subtle about it. The Cavaliers organization itself is not immune from the All-Star-voting-as-circus bug either. They are promoting Isaiah Thomas who is admittedly an all-star-caliber player, but not this season. He has played in only three games for a grand total of 59 minutes. The Celtics could argue that Gordon Hayward, who played roughly six minutes this season prior to getting injured, should be in the discussion. I realize Gordon can't possibly play in the game, but that never stopped Kobe Bryant. He was voted in 18 times, but for three of those he was injured and unable to play. He finally stopped the insanity and put out a plea for people not to vote for him. I love Isaiah, but come on. Don't teams have to have some level of decency when promoting their players as All-Stars? Hey @Celtics, how about Gordon Hayward #NBAVote? Dwyane Wade is not just a promoter. He is a promotee by way of the Cleveland organization. He is averaging 23.6 minutes. 11.2 points, 3.9 rebounds and 3.7 assists. Pretty good numbers for two quarters of play, but hardly the stuff of All-Stars. Those are Marcus Smart-type stats, but I don't see the Celtics organization grandstanding on Smart's behalf, nor should they. The latest vote-count for the Eastern Conference guards shows Kyrie Irving at number one, Dwyane Wade at #6, Isaiah Thomas at #7 and Jaylen Brown at #10. What got my attention was seeing Kyle Lowry at #8 and Bradley Beal at #9. Do the numbers seem skewed at all? I was surprised to not see Cavaliers point guard, London Perrantes, in the mix. For the Eastern front court, the numbers have more sanity to them. Lebron James sits at #2 with his teammate, Kevin Love, at #5. Celtics teammates Al Horford and Jayson Tatum are sixth and seventh, respectively. Cleveland forward, Cedi Osman, was nowhere to be found. NBA All-Star weekend is really great for the League and its fans. For the players, it gives them a much-needed break from the 82-game season and a chance to hook up with friends, former teammates and staff, and frankly, to enjoy the festivities. But it needs to be remembered that for many young players, becoming an All-Star is serious business. It means something special. NBA veterans and organizations that treat the weekend as if the circus just came to town may want to tone it down a bit. Reinstalling a bit of dignity into the celebration might be a good idea.